We left Standing Bear Farm this morning with our sights set on a big day of hiking. My shin miraculously stopped hurting and the sun was shining down on us all day. This was our best day of weather in awhile and we were going to take advantage of the heat and sunlight. We had some pretty steep ascents in the morning. We climbed to the top of Snowbird Mountain where there’s an FAA tower. I had never seen one before, so it was very interesting to see up close. I don’t know too much about them, but they’re used for air traffic control. Snowbird is a grassy bald, so we decided to soak up the sun and take a break here. We finally remembered to put on sunscreen this morning. Our faces were already burnt, but I don’t even think about putting on sunscreen unless it’s hot outside. I’d say it was in the 60s today, which may not seem hot for some of you, but when you’ve been hiking in 30-40 degree weather, 60 is a heat wave! 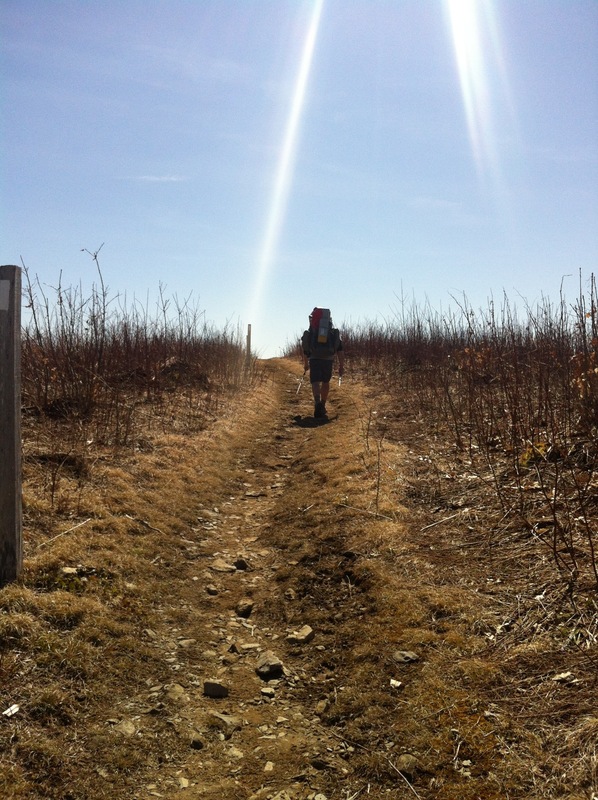 Around 4, we summited Max Patch, one of the sweetest mountains on the entire AT. It’s a huge grassy bald with 360 degree views of the surrounding mountains, including the Smokies. And you know, it was awesome to look back on the Smokies and know that we had conquered that beast. And it was even better since we enjoyed the views as we took in some trail magic from Roger and Rose, a couple from South Carolina. They fed us hot dogs, fruit, Little Debbie’s, chocolates, soda, and beer. I was really craving fruit today, so this unexpected trail magic really hit the spot. A Natty Ice in one hand and an apple in the other; all of the steep climbs today were so worth it. We hope we are some with snow, but there may still be a chance unfortunately. You have inspired me, not to be a thru-hiker, but to get back into my blog, All’s Well, which I started with my husband years ago when we were traveling and couch-surfing through Southeast Asia. Thanks for the recommendations. I’ll be sure to get my hands on them when I return to Maine! Keep up the great work, looks like u guys are getn your legs!! So cool of u to take time to update the blog.. Love following along and the fact a few days ago u wrote a comment about not an inclination to quit!!!!! All the best Njoy it out there!! !